Two tribes battle for control of ancient Ireland, and Brigid must find her place among them, trapped between the will of her people and the desires of her heart. 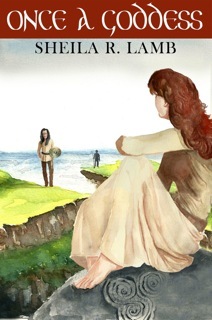 For the sake of peace, Brigid of the supernatural Túatha dé Danann enters into an arranged marriage with Bres, the next chieftain of the enemy Fomorian tribe, whose iron weapons and brute strength challenge the Danann magic. The Danann instruct Brigid to spy for them, and to keep the source of their powers secret, dangerous tasks that complicate her goal of making the best of her forced union. Sacrificing her own hope for love, Brigid faces the Fomorians alone. She must confront her rival, Morrigan, who competes for Bres's affections, as she begins to suspect that he is breaking the truce through lies and political manipulation. When his tyranny threatens the very existence of the Danann, Brigid must risk her life to unseat Bres from power. Set in a time when myths were reality, Once A Goddess brings the legend of Ireland's magical Túatha dé Danann to life. I enjoy historical fiction because a story can sweep me into foreign lands and eras in the past I know little about. Once A Goddess, by Sheila R. Lamb introduces to three sets people named the Túatha dé Danann, the Fomorians, and the Fir Bolgs in ancient, mythological Ireland. From the moment I began reading, the rich prose set a vivid picture and endeared me to Brigid, a young woman obligated to marry Bres, the future chief of an enemy tribe, in order to keep peace between them. But she is expected to spy and report findings to her village leaders. As she adjusts to the foreign ways of her new village, Bres is a good husband. But soon, dark secrets arise to threaten their peace. Thrust into a near impossible situations, Brigid must make some hard choices, and it is this, in addition to the tantalizing way in which the author reveals the secrets, that drives the story. Unrequited love, passionate liaisons, lies and deception, treachery and betrayal line this novels pages. It is an emotionally provocative and compelling story and I enjoyed the exotic setting and adventure this story offers. A unique book worth reading and highly recommended.